After a month in Japan, we finally have internet in our apartment. I never thought I’d say it, but I miss the low muss, low fuss approach of Comcast. Our service window was 1-5 p.m. on this rainy Friday, which means they showed up around 4:30. After checking a couple things, the technician makes a phone call, then hands me the phone. The man on the other end wants me to try and set it up myself. He asks to speak to the technician, who after a short chat, hands the phone back to me. The technician will return shortly with a CD and some cable. NTT technician splicing our internet into the above-ground wires. “Some cable” involves a roll of electrical tape, a lift truck and some serious cable splicing 20 feet off the ground. Not to mention his sidekick, a dude in a white hazmat suit with flashing red lights built into it, holding a red LED wand and directing traffic like some Darth Vader/Breaking Bad/air traffic controller hybrid. 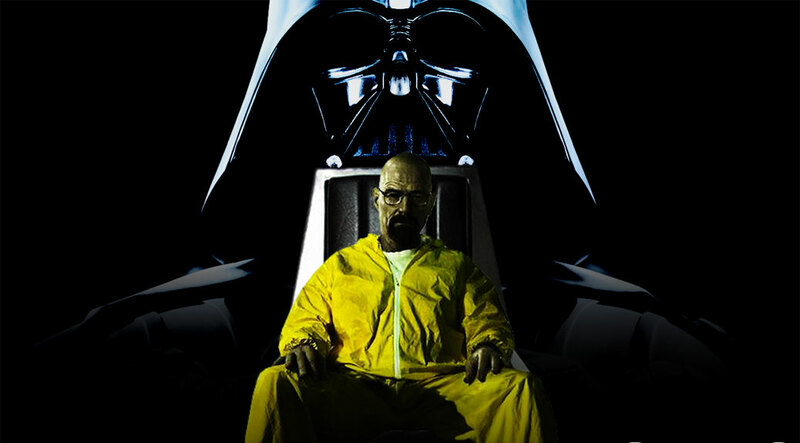 To be fair, the NTT guy was not nearly as scary as this combination. 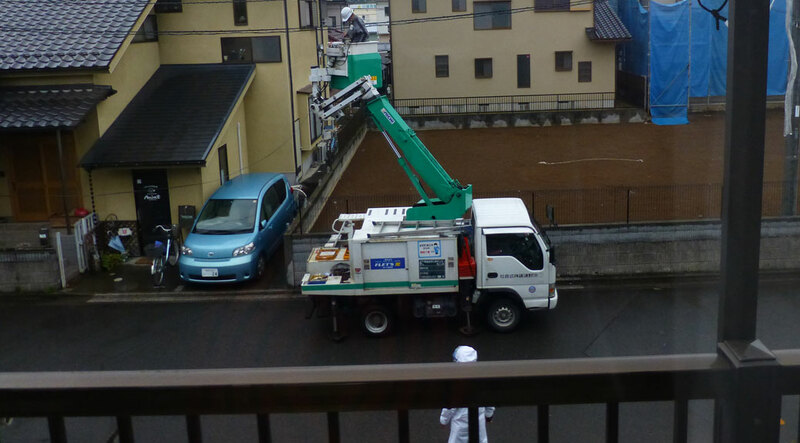 This was followed by a lot of drilling and banging as our internet, its lifeline securely strung over the street, was surgically inserted into our rented residence through the same slightly-opened window our air conditioning vents out. We’re SO going to be on the news when he goes over the railing. Fortunately, this seasoned pro dodges the precarious situation on the porch. It goes a little geek for a minute as he starts to set up the hardware and service, scanning QR codes with his phone, connecting the account to the modem. Then he’s done. Gomenasai he says. Sorry. Basically, there’s no help for the English-speaking beyond this point. 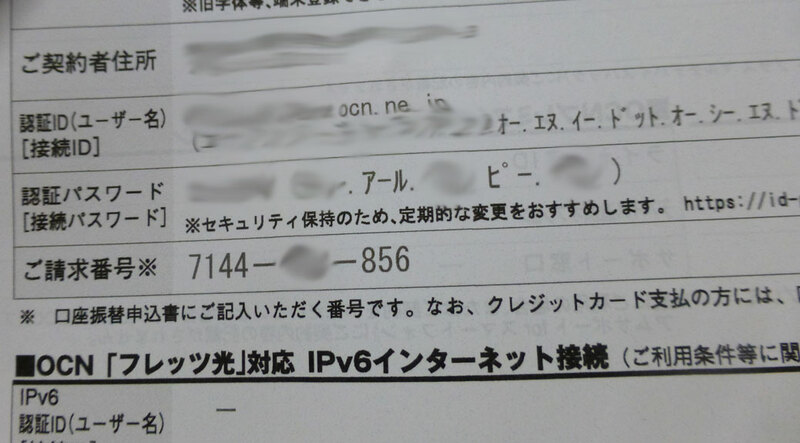 I have a stack of papers with various network names, usernames and passwords, labeled in Japanese. I have a CD with “easy” setup instructions… all in Japanese. Suffice to say, the CD doesn’t work. I start matching screenshots and kanji, navigating my way through the setup. Fail. Fail. SUCCESS! I have internet! I hope that was all he meant by “we’d like you to try and set it up yourself,” because I’m pretty sure none of that other stuff was happening.